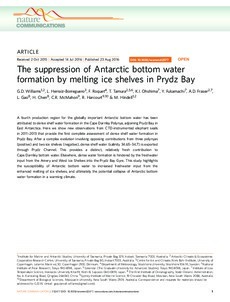 A fourth production region for the globally important Antarctic bottom water has been attributed to dense shelf water formation in the Cape Darnley Polynya, adjoining Prydz Bay in East Antarctica. Here we show new observations from CTD-instrumented elephant seals in 2011�13 that provide the first complete assessment of dense shelf water formation in Prydz Bay. After a complex evolution involving opposing contributions from three polynyas (positive) and two ice shelves (negative), dense shelf water (salinity 34.65�.7) is exported through Prydz Channel. This provides a distinct, relatively fresh contribution to Cape Darnley bottom water. Elsewhere, dense water formation is hindered by the freshwater input from the Amery and West Ice Shelves into the Prydz Bay Gyre. This study highlights the susceptibility of Antarctic bottom water to increased freshwater input from the enhanced melting of ice shelves, and ultimately the potential collapse of Antarctic bottom water formation in a warming climate.